Originally intended as a wrist-borne sprinkler system for combatting tiny fires, it was invented in 1908 by Nigel Fitsip, and I just made that bit up. Sorry, I’ll be serious now, honest. The FitSip consists of a neoprene cover secured to a forearm (or possibly a slim calf, if you’re very bendy and a bit weird) by velcro. A BPA/phthalate-free bladder zips into the cover so that it sits on top of the forearm with the nozzle protruding out from the wrist. It’s a snug fit and feels a bit strange at first (when full, it’s a bit like a having a blood-pressure cuff on your forearm) but you soon get used to it. 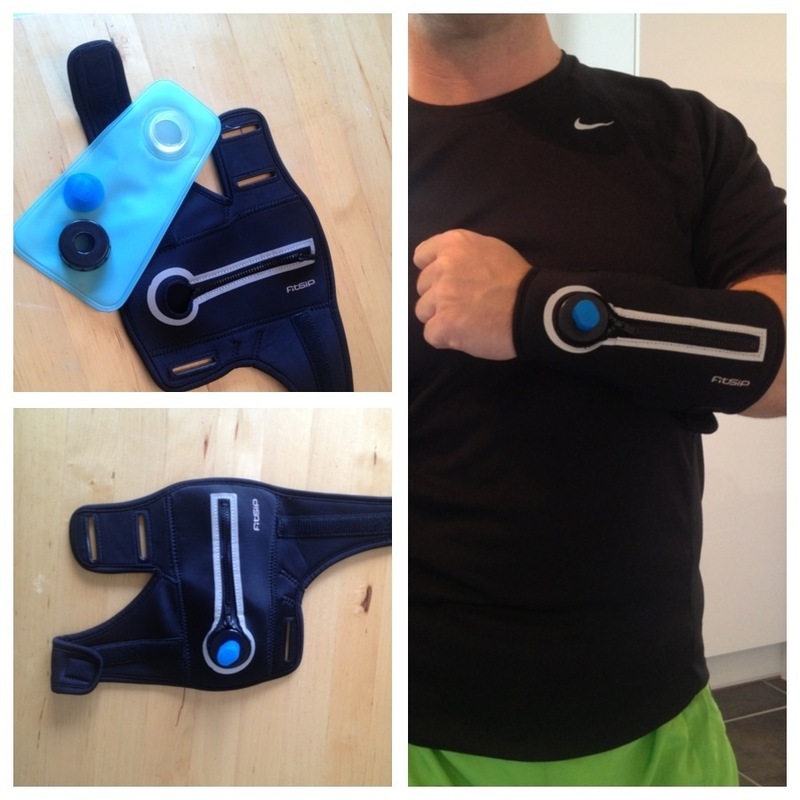 More importantly, it doesn’t slip or move around, even when sweaty. Setting off on the run, I did feel a bit conscious of the extra weight on my right arm, but not to the extent that I had to run round in tiny little clockwise circles. The FitSip’s most obvious Achilles heel is the relatively small 220ml capacity. It might not seem a lot (because it isn’t) but I don’t normally bother carrying water unless it’s a particularly long training run, and even then I only tend to drink enough to replace what I’ve lost in sweat or to wash down a gel, so it suited me just fine. There’s a bit of a knack to using the FitSip, and at first I was only getting a faint trickle of water for what seemed like a lifetime of furious sucking. However, I soon worked out that the trick is to use a kind of bite-and-pull motion on the valve rather than chewing it like I had been doing. 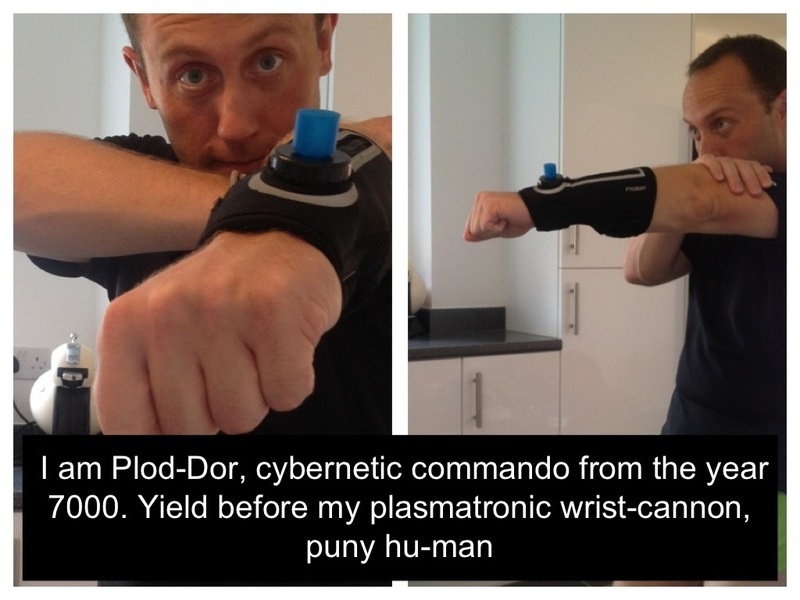 It also helps to lift the elbow high (preferably the arm that’s got the FitSip strapped to it). With minimal practice, I was getting a refreshing mouthful of Gatorade with one smooth economical motion, like a little juice ninja. Looks a bit like an Omintrix. I felt that the FitSip’s usefulness didn’t quite justify its relative size and conspicuousness. It’d be great if they could include some more features without adding too much bulk; maybe a small key/coin pocket and an absorbent strip to wipe your sweaty-but-hydrated brow with. Less cumbersome than a hydration pack, and less hassle than carrying a bottle*. This piece of kit won’t appeal to everyone, but I can see it being a popular solution for a lot of people. Don’t be surprised to see FitSip’s popping up more and more at your local Parkrun over the summer. * I read somewhere that the tightness caused by maintaining a grip while running can affect form and potentially result in long-term shoulder/neck/back problems. I wish I’d known this before I spent the entire duration of that half-marathon trying to open a pickle jar. DISCLAIMER: Many thanks to Belinda Goldsmith and everyone else at Team FitSip for letting me try their product. I was sent a FitSip for the purpose of testing, but didn’t receive any payment or other incentive. ‘Little juice ninja’- love it!! Good ‘Plod-Dor’ mad eyes! Just like a proper super villain! You forgot to mention though – does it shoot lasers too? No, it doesn’t. Which probably explains why I look so angry. I think with a bit of a tinkering, it could be adapted to squirt acid or poison. But I think that would be considered “evil”. It’s political correctness gone mad! I’ve mastered the art of busting out a commando roll, coming up on one knee and firing off a quick “pew pew” whenever startled mid-run. I like this – can you put them in contact with me as I have an idea for them or I may want some of their bladders to trial my idea…. Brilliant review, had me lolling!